When you’re on a budget and trying to pay down debt or save up money for a big purchase, you tend to cut out any unnecessary spending. Hobbies are often one of the first things to go. Getting out of debt will definitely improve your mental and emotional health as well, but you don’t have to completely eliminate everything that brings joy into your life to become debt-free. Here are five low-cost hobbies to consider for when you’re on a budget. Gardening is one of the best hobbies if you’re trying to get out of debt. Invest in learning about vegetable gardening so that you not only form a new hobby, but save money by growing your own produce! Seed packets are often sold for very little money. Plant some seeds in some dirt and you’re pretty much good to go. Save water in containers from local rainfall. Gardeners get a lot of pleasure and satisfaction by literally watching the fruits of their labor grow. You don’t need to invest in much to get yourself outdoors –just a decent pair of shoes, I use slippers for plantar fasciitis and they are at a good price. And unless you’re planning on doing some major long-mileage hikes, a pair of running shoes will do just fine. Soak up the great outdoors and see what Mother Nature offers you for free by choosing a different hike to go on every weekend. To expand your hobby, consider starting a running club with other local runners. These days, it’s really easy to find Facebook groups for local run groups or consider starting your own. Start a game night with friends. Everybody brings a board game or heck, for even cheaper, you don’t even need to buy board games! Games like Pictionary and Charades don’t even require a purchase. With everyone pitching in a game for game night, it helps keep the cost manageable and keep the hosting budget-conscious too by making it a potluck of snacks. Oftentimes, we have the best of intentions of giving back and volunteering and just never get around to it. If you’re looking to really strengthen your emotional health, consider volunteering for a cause you feel passionate about. I know plenty of people who have volunteered for the animal shelter or a local homeless shelter for women and children, and get plenty of satisfaction. You really and truly feel like you’re making a difference in someone else’s life. Crossword puzzles and brain exercise games, like Sudoku, are wonderful hobbies that can really help improve mental health. They also help keep you relaxed, and this hobby costs very little as you can find crosswords and brain games in most major newspapers. Ultimately, it’s important to remember that just because you’re paying off debt, doesn’t mean you have to put yourself last. 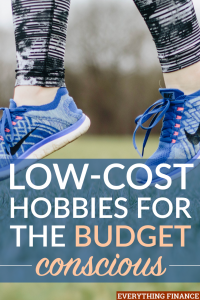 Keeping a cheap and inexpensive hobby in your life can do a lot to help with emotional and mental health, and may even help you remain gazelle intense in paying down your debt. What are your favorite low-cost hobbies?